Governor: Kathleen Sebelius (D) elected in 2002, re-elected in 2006. U.S. House: 2R, 2D - 1. J.Moran (R) | 2. N.Boyda (D) | 3. D.Moore (D) | 4. T.Tiahrt (R). U.S. Senate: Pat Roberts (R) up for re-election in 2008, Sam Brownback (R) re-elected in 2004. U.S. Senate: Sen. Pat Roberts (R) easily won his bid for re-election, defeating former Rep. Jim Slattery (D) by 727,121 to 441,339 with 42,170 votes split by two other candidates. U.S. House: In the 2nd CD, freshman Rep. Nancy Boyda (D) lost her bid for re-election to State Treasurer Lynn Jenkins (R) by 155,532 (50.61%) to 142,013 (46.21%) with 9,763 votes (3.18%) split by two other candidates. The balance of the U.S. House delegation reverts to 3R, 1D. Post-election: On March 2, 2009 President Obama nominated Gov. Kathleen Sebelius (D) to the position of Secretary of Health and Human Services. The Senate confirmed Sebelius on April 28, and Lt. Gov. Mark Parkinson was sworn in as governor the same day. > Republicans pick up one U.S. House seat. VEP Highest Office Turnout Rate: 62.5%. McCain-Palin carried Kansas with a plurality of 184,890 votes (14.96 percentage points). The Democratic ticket finished ahead in three counties: Douglas County (includes Lawrence, KS, home of Univ. of Kansas) and Wyandotte County/Kansas City, as in 2004 and Crawford County (in the Southeast on the Missouri border). 41 Delegates (32 Pledged and 9 Unpledged) and 5 Alternates. 1.01% of the 4,049 Delegate Votes. Unofficial Statewide Percentages: Clinton 25.30%, Edwards 0.10%, Kucinich 0.10%, Obama 73.30%, Richardson 0.00%, Uncommitted 0.00%. 39 Delegates: 3 RNC; 24 at-large; 12 by CD (3 x 4 CDs). 1.64% of the 2,380 Delegates. At-large - winner-take-all based on statewide votes from CD Caucus, as long as one candidate wins at least 2 CDs. CD - winner-take-all per CD based on CD Caucus. Giuliani - Kansas State Representative Kevin Yoder of Overland Park and Garden City Commissioner J.R. Behan (Nov. 16, 2007 release). Romney - Kris Kobach, chairman of the Kansas Republican party and a professor at the University of Missouri-Kansas City School of Law (Jan. 28, 2008). Provisional votes likely to be added in sometime in the Spring. Kansas statutes provide for a presidential preference primary election (Chapter 45, Article 45 >), however the state has only held presidential primaries in 1980 and 1992. 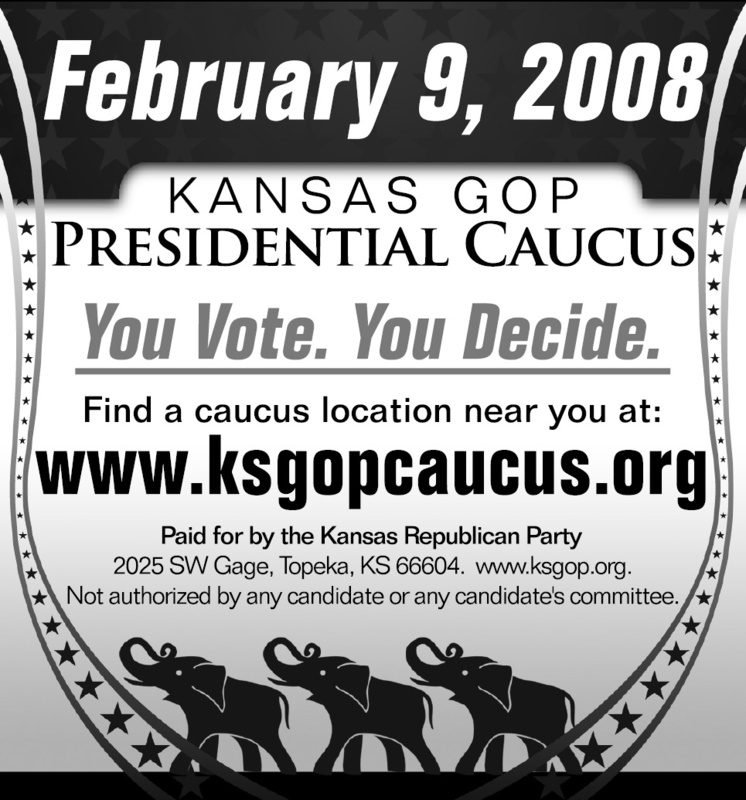 In the first part of 2007 it appeared quite possible that Kansas could hold a presidential primary in February 2008. Stephanie Wing, a spokesperson for the Secretary of State, stated (Jan. 12, 2007 e-mail), "Several members of the legislature have publicly stated they are onboard, and one Senator (Senator Phil Journey, R-Wichita) is prepared to introduce a bill asking for one. The governor is also supporting the idea, and included the funding in her new budget." More broadly, Secretary of State Ron Thornburgh hoped to build support for an early Midwestern regional primary. A relatively early primary would likely have given a boost to native son Sen. Sam Brownback, a candidate for the Republican nomination. In the end it came down to spending priorities. The $1.6 million-plus that would have been needed to reimburse counties for a primary proved too much. By the end of the session the legislature failed to approve funding, and the parties will hold caucuses (Republicans). Tim Carpenter. "Kansas presidential primary real possibility." The Capital-Journal, Jan. 12, 2007. John Hanna (AP). "Will Midwestern bloc share a primary date in '08?" The Wichita Eagle, Dec. 1, 2006. VEP Highest Office Turnout Rate: 61.6%. Not since LBJ in 1964 has a Democratic presidential candidate carried Kansas. Bush improved upon his 2000 showing gaining a plurality of 301,463 votes (25.38 percentage points). 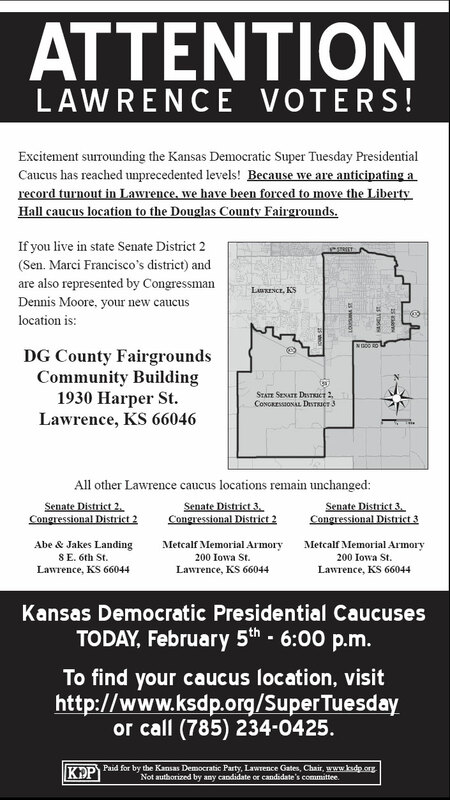 As in 2000, the Democratic ticket carried Douglas County (includes Lawrence, KS, home of Univ. of Kansas) and Wyandotte County/Kansas City. VEP Highest Office Turnout Rate: 55.6%. Kansas remained firmly in the Republican column as Bush-Cheney defeated Gore-Lieberman by a plurality of 223,056 votes (20.80 percentage points). Gore managed to carry just two of the state's 105 counties: Douglas (includes Lawrence, KS, home of Univ. of Kansas) and Wyandotte County/Kansas City. Copyright © 2002, 2003, 2004, 2005, 2006, 2007, 2008, 2009 Eric M. Appleman/Democracy in Action.